Heartbreaking and poetic, the Windmill Keepers is masterfully vivid in both language and content. One of my favorite reads this year. I found myself struck by the uncanny believability of two windmill corporations monopolizing the power of the world, all at the expense and sacrifice of misplaced orphans. Kite, the female protagonist, is brilliant—the now-orphaned daughter of an engineer—and her intelligence, both mental and emotional, is the true centerpiece of this story. You’ll love her, you’ll fight for her, and you’ll want to hug her a million and one times. Each character, in fact, will make you feel this way, but most of all, you’ll be taken by this dark and twisted fight-for-survival tale, and you won’t be able to stop reading until the last page…and even then, well, you’ll have to see. 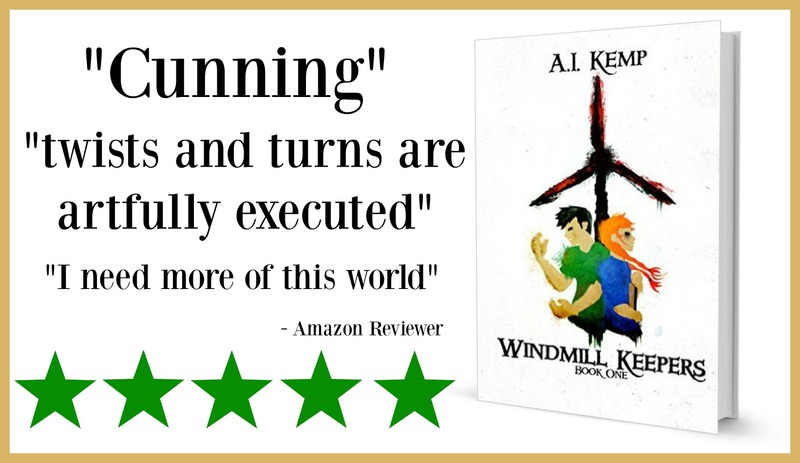 An underlying mystery will force you to keep going, to believe in the fight, and once resolved, you still remain in the grasp of the windmill corporations. A hopeful but brutal tale of a future gone terribly wrong. Recommended to: Lovers of dystopian fiction, strong female protagonists, symbolic writing, and harsh wake-up calls. I find Windmill Keepers, Book One, on my mind often. I need more of this world, to know the plight of the children and young adults caught up in an existence of hopelessness, fighting an underground battle for escape and survival. Cunning, bravery, subterfuge, and perseverance, exhibited by endearing characters, makes me cheer for each success and fear for their wellbeing from beginning to end. The world of evil corporations using child labor in the future? I can see it happening, as child labor laws stopped the practice in our own history, not by the robber baron’s voluntary disuse of children in life-threatening working conditions. Twists and turns are artfully executed by the authors, the most powerful for me was like being sucker punched, yet it was played out so simply, like turning a corner on a city street and being hit by a Mack truck. I never saw it coming. I want Book Two soon, please.